This is why we want to treat with Fumigilan in Sept. Treat all colonies with 2 gallons of 2:1 syrup or high fructose corn syrup with fumigilan for nosema. Show me your stuff, enter the fair. 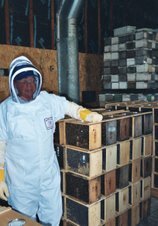 Now is the time for beekeepers to promote beekeeping. This link takes you to the ag - hort page. Find what you want to enter. There is a novice entry for people who have never entered. Follow the directions closely on what your entering. Not sure of what color your honey is? Usually our honey is in the white category. It has to look like dark tea to be classified light amber. Dark Amber is like the color of molasses. 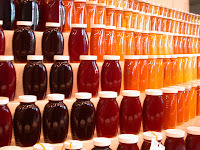 There are many categories, photography, comb honey, creamed honey, capped honey frame and more. Read through the premium book. This is fun, your friends and family will come and see your entry. You might win a ribbon and some money for your trouble. I have noticed before the bees looking for honey on empty supers I had in my garage. That is a sign of no nectar flow. I thought the flow had stopped. This week the bees had stopped that behavior and some nectar was coming in again. Spotted Knapweed is blooming in the area and second cutting of hay has not happened due to dry conditions. The fields are blooming and the bees are taking advantage of it. Purple Loose Strife is starting to bloom also in the Stillwater area. I checked my hives last week and added supers to colonies that had honey in the top box. I had a very good rain today. I hope there is results from this. I have noticed the bees looking to rob. This usually means the nectar flow has slowed down. While working in my barn today, I noticed bees on some empty supers. There was nothing in them but they were looking for some old honey. When the nectar flow stops and robbing begins, this is when AFB gets passed around. Make sure to deal with any weak colonies that may have this disease. I went and looked at my hives. Several of my hives needed more supers. It is important to stay ahead of the bees. Bees have a hoarding instinct, the more space they have to fill, the harder they try too fill it. When I go to pull the honey off the colonies, and I see the top super is packed solid, I know I didn't have enough supers on. That hive would have produced more honey and I didn't give them the room. It is good to remember when drawing foundation, put the foundation directly above the brood nest. Move the full or mostly drawn supers up. I see white sweet clover starting to wane. Alfalfa should be blooming again shortly. Spotted Knapweed is starting to flower in the Stillwater area. Spotted Knapweed produces a very smooth honey that has a buttery flavor. Very good and worth the trouble of trying to extract separately. The last rain gave us 6/10" of rain in the Stillwater area according to Jerry Linser. This should help keep the nectar flow going. I am not worried that is on the dry side. It has been my experience that we get more honey when it is a little on the dry side. I was out checking on some comb honey today. I checked those hives last. Being careful not to get charcoal bits on the white cappings I had to take some precautions. Before I smoke the comb honey super, I put green grass in the spout of my smoker. This filters the charcoal and keeps the comb honey clean and white. It is very dry around the bee yard around Stillwater. Be careful with the smoker when out in the beeyard. I carry a fire extinguisher with me.